The Tab Display Size command is used to set the display width of the tab character within the current editor window. To set the default tab size for all future editing sessions, see the Configure | Preferences | Tabs dialog page. Boxer supports the use of either fixed or variable width tabs. When fixed width tabs are used, the display width of a tab is a constant value, though the effect of a tab within text will depend on its column location. When variable width tabs are used, the display value of a tab is computed so as to cause a jump to the next tab stop. Variable width tabs are sometimes referred to as typewriter style tabs, since they mimic the function of tab stops on early typewriters. Use this option to set the display size for fixed width tabs in the current file. Use this option to designate the columns at which variable width tab stops should occur in the current file. When viewing certain data files, it can sometimes be helpful to treat an additional character as though it were a tab, for display purposes only. For example, when viewing a file containing comma-separated fields (CSV), designating a comma as the additional tab character will allow Boxer to display the file with each field in its own column, greatly enhancing its on-screen readability. 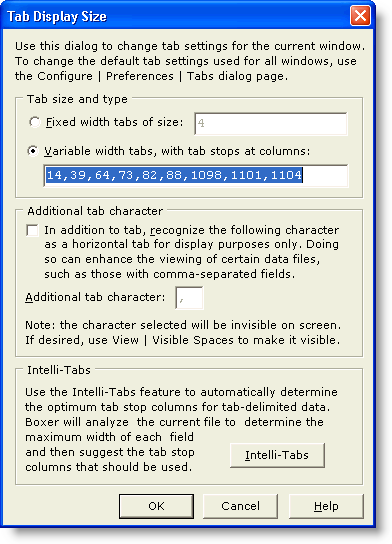 This option would typically be used when variable width tabs are in use, and most likely in conjunction with the Intelli-Tabs feature described below. When an additional character is designated as a tab, it will become invisible on screen, just as is the tab character. You can use the Visible Spaces command to make real tabs--and the additional tab character--visible on screen. If a comma is designated as the additional tab character, please note that it is not possible to properly process quote and comma-delimited data files whose field data contains commas within the quoted fields. Boxer requires that the field separator character appear only between fields, and not within the data itself. In the help topic for the Replace command, the Process $1, $2, $3... substring directives in the replace string section contains an example that shows how embedded commas can be removed. When an additional tab character is in use, the Tabs to Spaces command will treat that character as though it was a tab. This makes it possible to convert a file that uses a character-separated field format (CSV, for example), to a fixed width field format. Use the Intelli-Tabs feature to automatically determine the optimum tab stop columns for tab-delimited data. Boxer will analyze the current file to determine the maximum width of each data field and then suggest the tab stop columns that should be used for optimum viewing. The Intelli-Tabs feature can also be used on files containing fixed width field data. If tabs (or 'additional tabs', see above) are not found in the data, fixed width field data is assumed. Then a secondary analysis is made to try to determine the boundaries of the fields. If a range of lines is selected, the secondary analysis will be restricted to the selected range. During its analysis, the Intelli-Tabs feature will often detect records whose field count differs from those of other records. When this happens, a report will be given, and the (first) non-conforming line number will be reported. As such, Intelli-Tabs can double as a useful tool for validating data files. Boxer's default fixed width Tab Display Size is 4, which permits program source code with several indent levels to be displayed without exceeding the screen width. Many other programs, and most printers, will treat Tabs as having a display size of 8. You may need to make adjustments in order to print or display files with another program which does not use a Tab display size of 4. One remedy could be to use the Tabs to Spaces command to convert a copy of the file before using it with the other program. Note that Boxer's Print command will automatically convert Tabs to Spaces before sending its data to the printer, so there will be no such difficulty when printing files from within Boxer. See the Insert Tab command for additional information about tabs. After selecting the proper tab stops for optimum viewing, consider using the View | Shaded Tab Zones command to colorize the background of adjacent fields. Tab settings can be designated on the command line using the -T option flag. See Command Line Options for more information. Files that have Syntax Highlighting applied are eligible to have their tab stop settings defined as part of the syntax information for the language being highlighted. See Configure | Syntax Highlighting for more information. The parameter of interest is the Tab Stops parameter. Tabs, spaces and newline characters can be made visible with the Visible Spaces command.